With Steam Dreams UK not running a 2018 tour this year, Railtours Ireland have taken the opportunity to expand their annual "Emerald Isle Express" landcruise to two departures for the 2018 season. The first tour of the 2018 season started on Sunday 10th June with a week long tour of Ireland visiting Wexford, Waterford, Cork, Killarney, Ennis and Westport. I was able to travel on the tour on Wednesday 13th June from Limerick to Athlone via Galway. The reaminder of your day is free in Dublin. We will be delighted to offer advice and tips about what you might like to do. We also provide a Hop On Hop Off Dublin Bus Sightseeing ticket which will allow you to explore the top attractions in Dublin such as Guinness Storehouse, Trinity College, Kilmainham Gaol to mention but a few!! Champagne reception at Connolly Station before boarding the Emerald Isle Express, your own private heritage train. Cruise by rail down Ireland's scenic east coast through counties Wicklow and Wexford to Roslare Strand. Bus transfer to Waterford City. Private visit to Waterford Crystal, dinner and overnight stay in Mount Juliet Estate. Train operates empty Rosslare Strand - Rosslare Europort - Connolly - Kildare - Kilkenny. By rail from Thomastown through the Suir Valley in County Tipperary to Cork and a visit to Blarney Castle and Cork City's English Market. Overnight stay in the five star Fota Island Resort. Train operates empty Kilkenny - Thomastown. Visit Cobh, Titanic's last port of call and then rail to Killarney for a tour of The Ring of Kerry. Overnight in the five star Killarney Park Hotel situated in the centre of Killarney. 5 Star Killarney Park Hotel, Killarney, County Kerry. Visit The Cliffs of Moher with lunch at Gus O Connors famous pub in the fishing village of Doolin. 5 Star Ashford Castle, Cong, Co Mayo. Train operates empty Ennis - Athenry - Galway - Athlone - Claremorris. Take a tour to Galway City, The Medieval City of the Tribes! Train stables in Claremorris for the day. 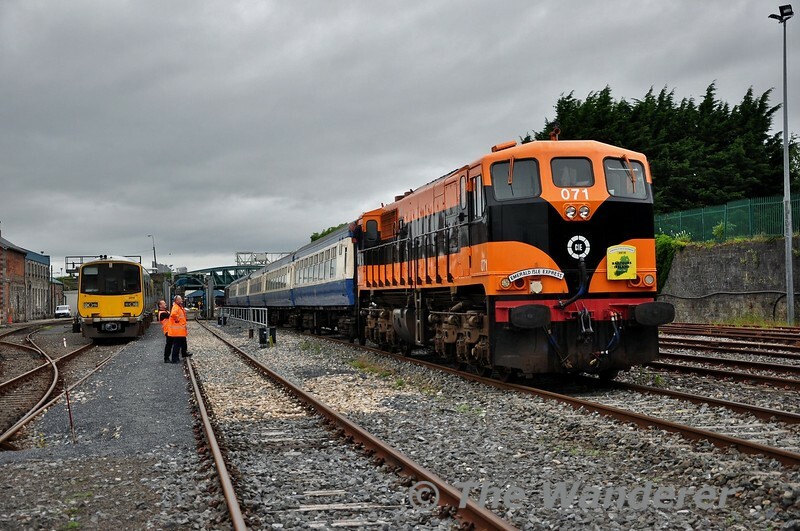 Train operates empty Claremorris to Westport.